There's a new retro Volkswagen to promote their products. After some success with their black 1960s VW Bug "Max", VW is now introducing "Bus" - a read and white 1968 Microbus. "Bus" doesn't have the heavy German accent of "Max", instead, he is an American with a voice from actor Thomas Haden Church. 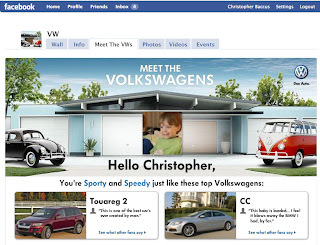 Bus made his debut on the new Crispin-Porter Facebook application Meet the Volkswagens. From USA Today: "Why Facebook? 'More and more consumers are selling products for us,' says Charlie Taylor, general manager for VW's digital marketing. 'Social media and word of mouth is much less about brochure downloads and more about brand awareness.'" Taylor is absolutely right, social media is about brand awareness. 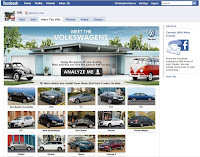 The landing page of Meet the Volkswagens is welcoming and has a clear call to action to have the page "Analyze Me". This action captures keywords from your Facebook profile and through some magical algorithm spits out two VWs that are just right for you. So what was right for me? Well, apparently I'm speedy and sporty - must be the BMW in my profile; though, it missed how I drive a hardtop convertible. So why didn't I end up with the Eos - apparently not speedy or sporty enough, which is honestly true. Instead, I was prompted with access to VW fan pages for the Passat CC and Touareg 2. While I am told I'm speedy and sporty, why the application selected the two vehicles isn't really clear. There could've been some better messaging about the products once chosen for me that could share why they were selected, but this is a minor point. The bigger issue is that each vehicle selected leads you to that page's Facebook fan page. The Passat CC page had only 3 posts on it (2 from VW), only 54 fans, and showcased a couple pictures. There just wasn't anything to do once I got there. What was I supposed to do? I could "fan" the page but other than that people are probably just going to go back to talking to their friends and forget about the VW Passat CC fan page. All of the automotive experiments on social media are just that experiments. The VW effort can be successful, depending on the metrics the campaign is seeking. It appears to me they are just looking to increase their Fans on vehicle pages and with that they can increase their communications with the car's fans going forward. This is probably just phase one of a multi-dimensional plan. I look forward to seeing how this evolves now that I'm a fan of the Passat CC and Touareg 2.